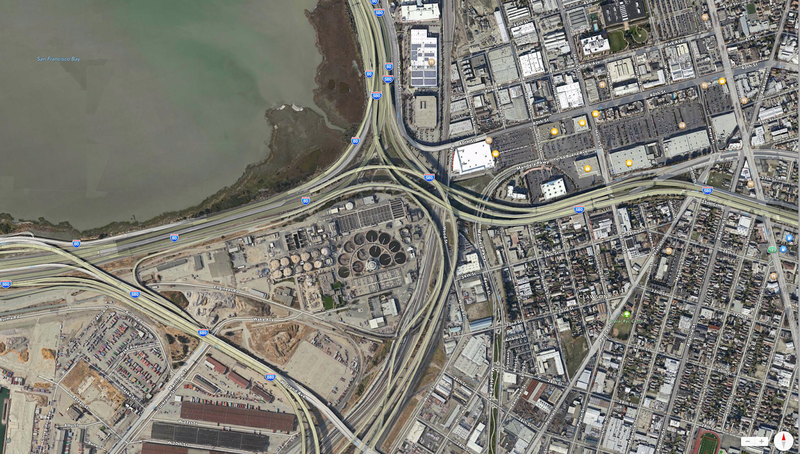 Another interchange, the I-580 to I-80 in Oakland. The East Bay Viaduct (33 0611L) is the tall connector shown above that goes over all the other bridges. It's a rare (in California) 51 span steel girder bridge, which was chosen so they could quickly assemble the superstructure over existing expressways. It was built in 1998 as part of the replacement for the damaged Cypress Expressway. Alameda County, California Bridges: East Bay Viaduct by Mark Yashinsky is licensed under a Creative Commons Attribution-NonCommercial-NoDerivatives 4.0 International License.